We talked about the Samsung Galaxy Skin a few days ago, brandishing rumors of the flexible smartphone arriving sometime next year – and that rumor has been confirmed. Here is more information about this stunning new smartphone that will definitely make Apple’s iPhone 6 (no, that was not a typo) look as though it was something cobbled together during Alexander Graham Bell’s era. Using the material ‘graphene’ for its display, this has been touted to be “the miracle material” which will make flexible displays a reality by the time the Skin hits the market. This polyimide substrate will replace the glass which most, if not all, smartphones use at the moment, where it is soft enough to be rollable and bendable without suffering any damage to image quality, and yet it can still survive blows from a hammer. 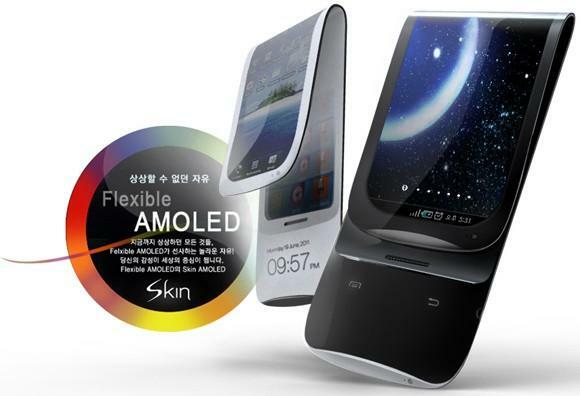 Do expect the Samsung Galaxy Skin to be as thick and wide as the Galaxy S2, although the display will have double the length when unfolded. We did miss out on the dimensions and internal memory capacities in our previous story – the Galaxy Skin is said to measure 221mm x 67mm x 8 mm, while coming in 16GB and 32GB capacities.